Thirty years after Neil Young's original 1977 Chrome Dreams recording – an album that was surprisingly shelved by the record company – Young recaptures the fire and diversity of that period. Drawing from three songs written previously and seven new songs, the latest Neil Young includes a wide mix. Acoustic, electric, aggressive, melodic – it's all that and more. Young, with a backing band that includes Crazy Horse drummer Ralph Molina, bassist Rick Rosas and pedal steel guitarist Ben Keith, jams through 10 numbers, including two monster tracks that time out at 18:30 and 13:00. 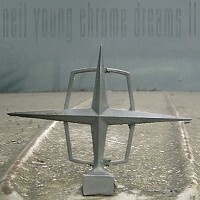 Chrome Dreams II is Young's seventh studio album in as many years. Neil, I knew you would be back. Just like the 80's when I thought you were done from several bad albums, you come back strong. Hope you have more. Experimenting more with trumpet and Are You Passionate stylings, and a children's choir track that is not overdone or cheesy ( very hard to do). Great guitar licks and tone, jamming, acoustic stuff from the heart but not so lame and poorly written as Prairie Wind. Great pressing, master, and transfers!